Spruance class destroyers were developed for the primary mission of anti-submarine warfare, including operations as an integral part of attack carrier forces. The ships are the first class of ships in the US Navy to have gas turbine power. The four general electric LM-2500 engines produce a total of 80,000 shaft horsepower, they can drive the ship in excess of 30 knots. They also make it possible to conduct such operations with minimal notice and with less fuel logistics concerns. Excellent command and control capabilities assures a thorough, carefully controlled effort. Utilizing highly developed weapons systems, SPRUANCE is designed to hunt down and destroy high speed submarines in all weather, but can also engage ships, aircraft, and shore targets. These multi-purpose combatants are also capable of providing naval gunfire support in conjunction with Marine amphibious operations worldwide.Ships of this class fired 112 Tomahawk cruise missiles into Iraq during Operation Desert Storm. 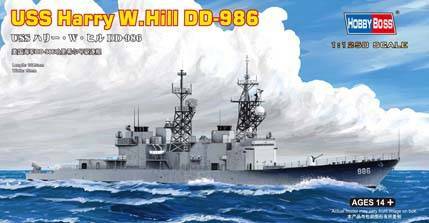 Spruance class destroyers have been retired.